Normally, I like to give my albums a title. What's a book without a title right? This album we're simply going to call "Panda". My oldest daughter said the designed reminded her of Pandas. Her best friend likes Pandas and everyone knows Panda's like to eat bamboo leaves. That's what reminded her of the Pandas...the leaves. I thought they looked more like palm leaves, but who am I to argue with the mind of an eight-year-old? As you can see, once the parchment paper dried, it came out very nice. I cut it to size and laid it in as our first page. You can see through the parchment paper to the next page of the book. 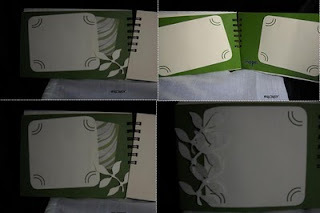 I actually did a cut out of leaf and the green you see is the next page attached. It's a perfect page for writing in the name, date, or event of this album. As you can see in these two photos, I added some special photo pages. Like my other albums, you can slide a 3.5" x 5" photo graph into the rounded corners of these pre-designed areas. I added some dimensional and stamped and glittered leaves along with some simple word usage like: believe, hope, cherish. In between the green photo pages are ivory card stock pages stamped with a single leaf. Since all the pages of this album are acid-free and lingign-free. These blank pages can be used for signatures and well wishes for a guest book or additional photographs for a lovely album. And it wouldn't be a MRsCHADT handcrafted book without my new signature book pouches. 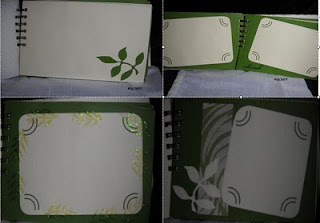 This one I stamped with the same green leaf that I used in the album. I took some green netting for the closure and a simple white bead. My favorite feature of this album is the see through parchment page stamped and traced in glitter. What do you like best?